Yee-haw! Come face-to-face with a few of your Toy Story pals at a photo-filled Character Encounter in Disney·Pixar Toy Story Land. *Greeting periodically throughout the day. 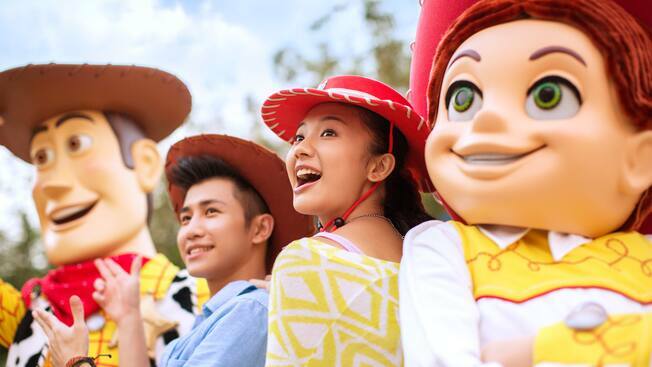 Mosey into this Western town where you can meet, greet and pose for pictures with Woody and Jessie! Located in Disney·Pixar Toy Story Land, Meeting Post is the place to come across the iconic, cowboy-themed Characters from the Toy Story films. Be sure to have a camera or mobile device handy-and capture yourself memory that'll last a lifetime! Woody is a lanky sheriff toy. All the toys in Andy’s room look up to him. He’s smart, kind, and brave like a cowboy should be. He’s more than a toy, he’s a friend. He and Buzz Lightyear are best friends. Jessie is a rough and tumble cowgirl doll. She is known for her yodeling. Once abandoned by her original owner, Jessie is so happy to be one of Andy’s toys. Beginning April 26, 2018, get ready to shrink down to the size of a toy in a high-spirited, colorful new world! A day of laughter and fun awaits in Disney·Pixar Toy Story Land, a larger-than-life new addition to Shanghai Disneyland. Set in the midst of Andy’s backyard, it’s a place where Sheriff Woody, Buzz Lightyear, Jessie the yodeling cowgirl and so many of your favorite Toy Story pals have come to life… and are ready to play!